SO the weekend after Eurocioc, my program decided to take us on a little excursion to TUSCANY. And, might I add, the excursion was, say, 4… 5 hours by bus? Not a little excursion at all, by any means, but hey…. it’s little to me (I guess). You remember how Perugia was a city on a mountainside and the view was amazing? Siena is also a city on a mountainside, except you can’t see anything unless you go onto the top of the Duomo di Siena and look out across the entirety of Tuscany. Honestly, I thought my heart was going to stop. Siena is a city that is just as Italian as Perugia – except in a different way. Where Perugia had views and a rustic quality, as well as lots of trees and fun little dirt-path alleyways, Siena was a city made entirely of cobblestone and marble. The only plants you can find are the trees planted in front of the church, or at each section of the city. For a small city though, Siena has seventeen quadrants. You know how New York City has the five boroughs? Manhattan, Staten Island, Brooklyn, the Bronx, and Queens? Siena has something similar, except theirs is a cultural divide, as well as an aerial divide. Each of their little niches has it’s own animal, colors, and flag, and they race each other at horses in the big square in the middle of the city, twice, each year. They fill the racetrack with dirt (cause in the old days they just kept it as cobblestone), and the spectators sit in the middle of the ring instead of the outside. Wild! The entire time our guide was telling us about this, I kept thinking, “this track is tiny, how to SEVENTEEN horses fit inside at once? Better yet, how do the people not get hurt?” Easy. They only have 9 or 10 horses during the first race of the year, in June, and then two horses get to go again during the second race in August, so that it’s even, and every year they rotate. Simple enough, right? Right. It confused me too, don’t worry. Don’t get it twisted though, even though Siena is ancient and rustic, and pretty much walls of cobble and marble, their shopping scene is excellent. Anything that you can find in Milano, you can find in Siena. I mean, heck, they even have a Kiko: Makeup Milano in Siena. Several, actually! 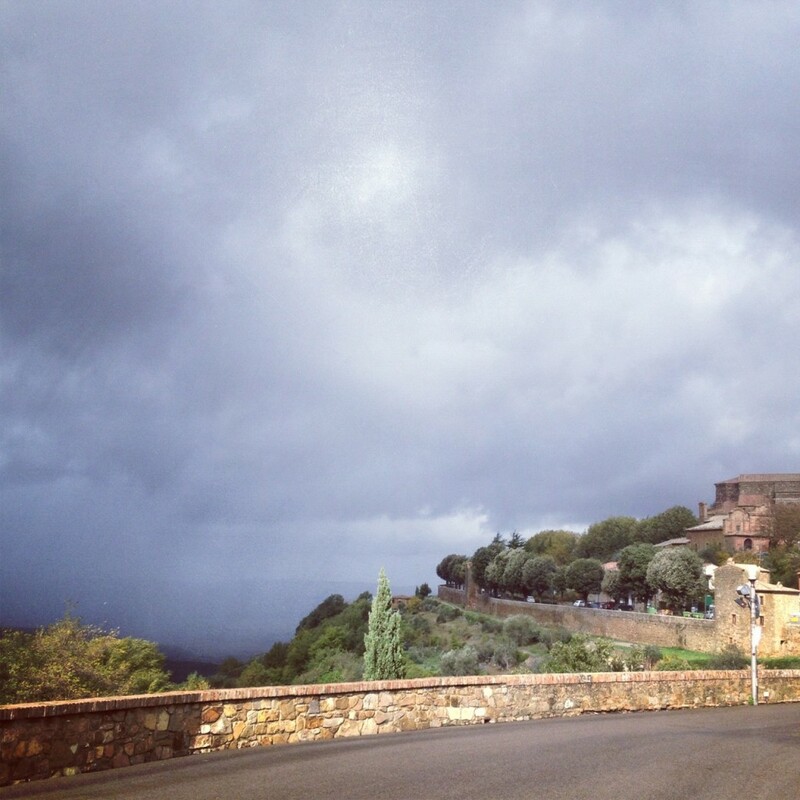 The next day, Saturday October 27, we field tripped to Montalcino and got to see a castle! A fricken castle man! I was so stoked. When you go up to the tippy top of the castle, you can see almost all of the surrounding area, and even though it was gloomy and rainy and windy (just how I like it, HOLLA SEATTLE) it was a mess of trees and green. I don’t know if I need to stress enough to ya’ll Puget Sounders how beautiful it was – I wish I could put pics! Oh wait. I can. iPhone, to the rescue!!! Awwwhh yeah that’s the stuff…. Anywho. Myself and a few other biddies on my program went to eat at a local Trattoria in Montalcino, and let me tell ya, it was absolutely FANTASGASMICYUM. Holy lord, it was so good. I think I may have broken a button on my jeans, it was that good! I had pasta with truffle mushroom olive sauce. ohmygoodnessgraciousmee. What a treat. I even bought myself a little jar to bring home! It was so good. Better than pesto. And I effing LOVE pesto (side note: pesto is the only reason I’m not vegan, yolo). While in Montalcino, I did what any sane person would do in a city famous for their wine: I bought two bottles plus a few Christmas ornaments. Oh yes, oh yes I did! Oh. I should also say that we stumbled upon some of the local schoolchildren singing fight songs to the other section of the city in Latin. I’d upload one of the videos I took of the experience but again, WordPress is poopy and my file exceeds the limit so that’s a no-go…. 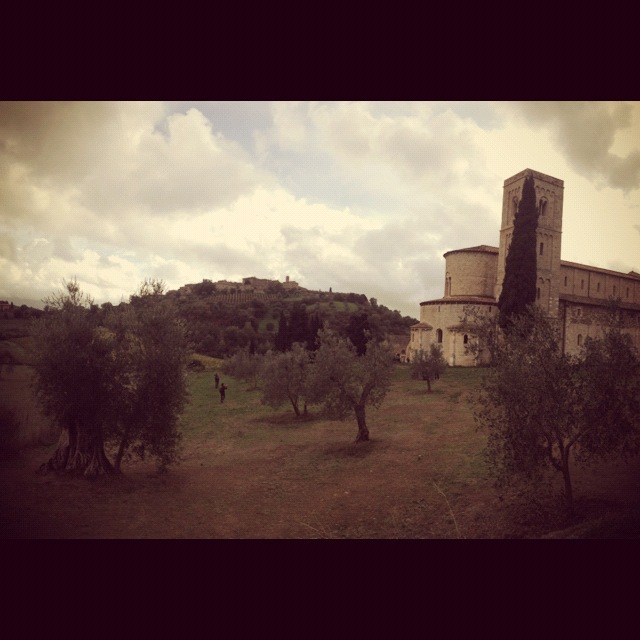 Later on that day, IES took us to the Sant’Antimo Monastery. Now, for anyone that knows me, they know that I am extremely un-religious. If anything, I’m pretty much against organized religion as a whole. However, this monastery was DOPE. We got to sit in on the monks doing their afternoon chant (which took like 30 minutes and I could barely hear, but that’s beside the point), and after, we got a tour of the Monastery. I think the most epic part was that the columns glow in sunlight when hit in a precise way, because they’re made out of this certain type of marble that glows in direct sun. Therefore, the entirety of the shrine to Jesus Christ glows when sunlight enters the cathedral end of the Monastery. How dope is that?!?! All in all, this trip was well worth the $40 paid to go on it. I do wish, however, we had gone to see the leaning tower of Pisa or went to Florence, but hey, you can’t always get what you want! Caffe’s/restaurants/places to eat are not open before 1pm. Ever. Life is but a box of WINE. K, I’m done with this post. NOW FOR COPENHAGEN.